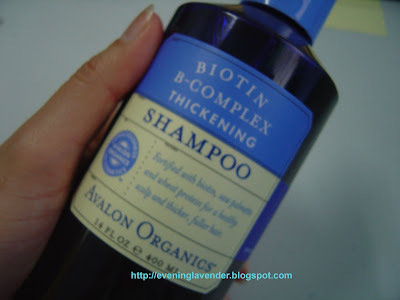 I have been using Avalon Organics Biotin B-Complex Thickening Shampoo for 4 weeks now and find that it reduces hair fall. Therefore, I am introducing it to you if you have similar concern. Signature ingredient: Made with a healing complex of B vitamins - biotin, niacin and panthenol - to nourish the hair and scalp for added body and shine, increased scalp circulation and stimulation of hair follicles. Product description: Specifically designed to to help restore thinning hair, this thickening shampoo is fortified with an elixir of biotin, saw palmetto and wheat protein to help control hair loss. It will help strengthen hair strands and boost body and volume for a healthy scalp and thicker, fuller looking hair. Features and benefits: This thickening shampoo is formulated with nourishing aloe and jojoba, stimulating rosemary, saw palmetto and smoothing, strengthening wheat protein. Who should use this product? For fine, lifeless or thinning hair. Directions for use: Apply to wet hair, lather and rinse. Gentle enough for daily use. Best if used in conjunction with Biotin B-Complex Thickening Conditioner. Have you tried this shampoo before? What is your favorite shampoo at the moment? Yes, I hope that this will be my Holy Grail (HG) Shampoo. Yes, i got a few more products from Avalon that I will be featuring in the coming weeks. hhee.. about shampoo I also try out but not this brand I used avon. hi, do u know where i can buy this shampoo? do u have any idea if BMS organic still sell them? You can purchase from BMS Organics located at One Utama new wing (LG 310 - next to Cold Storage)or SS2 outlet. Yes, i am sure that BMS Organics are still selling this shampoo. Recently, i found out that I'm having hair loss problem especially during shower time. May i know how much does this shampoo sell in BMS Organics? is it suitable for oily scalp? yes very suitable for oily scalp. I have very oily scalp. May i know except One Utama, is there any place i can get this shampoo?I saw it is sold at this website http://www.lifestylegreensolutions.com/ but the price is expensive as compared to you bought at OneU. hie frnds is dis product avail. in india??? nd can u pls say its price?? Sorry i am not sure if this product is sold in India. Maybe u can check with India bloggers. Hi Lavender, i am Chloe Tan. 1st i would like to say thanks for your sharing, make me felt so happy to know Avalon is available at Malaysia.. But i am from Kuantan, Pahang, so I'm wondering that, do you have their contact number (BMS Organic)? 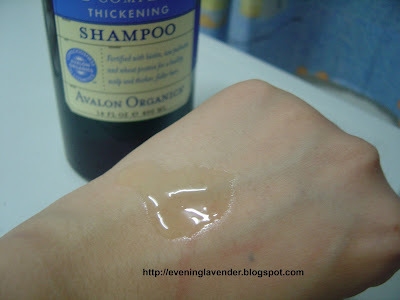 I've heard Avalon Lavender Nourishing Shampoo long time ago. Since i am not stay at KL, so i would like to make them a call before i go. Hi Lavender, i'm interested to try on this Shampoo. Do u help buy and ship? Because i don't have BMS located at my hometown? i will very appreciate if you can help on courier/post it to me, of cox i will arrange payment for you 1st. I can help you buy and courier to you but I will charge RM10 (for transport and parking). Courier fees you have to pay also. For your info the shampoo price went up , now is RM55 per bottle but I can get 10% discount as I have member card. If your are interested pls leave your contact no or email. Thanks for your helpful, Lavender.. I have do re-search at Avalon website, i would like to order Avalon Nourishing Shampoo, if they got a 950ml size, do you think BMS organics got take this stock from Avalon? Hi, Avalon Organics is a very good brand, I love all their products! I always buy this shampoo at iherb.com. It’s only $ 6.44, much cheaper than other stores, and the shipping is very fast. You can use my coupon code NAK992 to get $ 5 off + free shipping for orders over $ 40 + free samples. i stay in kelantan.can i ask u to buy for me the avalon shampoo?i ll bank in the money first.how can i contact u?can u give ur email? I need to charge you transport fee RM10 and courier fees(not sure how much). But I can get 10% discount for the shampoo. you can also call them direct to buy from them, if not mistaken they can send to you. It will be cheaper maybe. i.ve send u an email. i bought this shampoo from BMS Organics located at One Utama new wing (LG 310 - next to Cold Storage) and the price is rm55. Yes, it is RM55 now. Feb 9 2011 - I put in the comments already. Hi, recently I've started experiencing quite a lot of hairfall when I shampoo and I've seen this brand being recommended a few times already. Unfortunately I live in Kuantan and I don't think they sell it around here. So like the people above me, if you could I'd appreciate if you could but it for me. I'll deposit payment for the shampoo and the courier charge into your account. I also wanted to ask if you know if it's okay to use to shampoo if you have dandruff problem and is using a dandruff shampoo (Selsun Blue)? Also how much does the thickening conditioner cost? I'd be really greatful. This hairfall is really worrying me. I replied you. pls check your email. I've read that it smells good, that its hard to apply because it doesnt make any bubbles as a regular shampoo, but Ive noticed a really strong smell, like some home cleaning product, it does makes bubbles. Whats bugging me most is that the scalp treatment one smells just the same and it has the same texture and consistency, like a gel. Is that normal? I have not tried the scalp treatment. So I cannot comment. As for the shampoo I am not disturbed about the smell. It does not remind me of home cleaning agent. It has less bubbles than normal shampoo. maybe you should write to Avalon Organics to give them your feedback. Hi Lavender, I would like to buy the shampoo too as I've experiencing hair loss and itchy scalp. I dont know which shampoo to choose: tea tree mint or biotin. Please help me in choosing it. I went to BMS and it seems like they stopped selling Avalon products. Can I buy it at any other place? Thank you so much! Hi! I just found out that BMS stopped selling Avalon products. Is there any other place where I can buy Avalon products? Not just shampoo but their skin care products too. Thanks! Yes, BMS no longer sell this shampoo or skincare range. You can order online. I haven't tried any online site but if you can find it at strawberrynet.com it should be ok. I saw it in Spore pharmacy, if you have friends to help you. Great post all natural products are best. Natural organic shampoo is the best for your hair. it is help to grow hair also?? since one utama BMS stopped selling, how bout the SS2 outlet, where is place of it?? I think they have stopped selling this brand. They are now selling another brand. You can try that also.